You already love towns like Charlottesville, Asheville, and Fayetteville for their outdoor vibe, but the Southern Appalachians are full of lesser-known small towns that boast vibrant scenes and access to incredible adventure. Here’s a short list of candidates poised to become the South’s Next Great Mountain Town. Blue Ridge (pop. 1,200) has been a tourism hotspot since the scenic railroad started operating in the mid-90s but has somehow managed to keep its small town vibe. “The town has done a good job of keeping the ‘Applebees’ out of the city limits, so people can still come here from Atlanta to spend a day in Mayberry,” says Sam Curlee, owner of Cycle South and Blue Ridge resident since 1998. While the chains have been kept at bay, outdoor lovers have been welcomed with open arms. More than 40 percent of the county surrounding Blue Ridge is occupied by the Chattahoochee National Forest, and in the last few years, a younger, more active crowd has discovered that this hamlet, an easy 90-minute drive from Atlanta, is perched at the edge of some of North Georgia’s best recreation. With the development of new businesses like a brewery and a paddleboard surf shop, you’ve got the makings of a mountain town on the rise. Play: Hikers can pick up the Benton Mackaye Trail off Highway 60 and hike three miles to the Toccoa River suspension bridge. Bring lunch and take a dip. Blue Ridge Mountain Outfitters also offers guided hikes to more adventurous spots inside the Cohutta Wilderness. Cycle South owner Sam Curlee says the Aska Trails, 15 minutes outside of town, are the toughest in Georgia: “Expect steep and rough riding, but true singletrack.” You can piece massive rides together in the 20-mile trail system, but start with the Flat Creek Trail for a self-contained loop. Rent a stand up paddleboard from Surf Blue Ridge and head downriver on the Toccoa below the dam for some fun class I-II river running, or cruise the 3,000-acre Lake Blue Ridge for a more mellow vibe. Eat: For coffee and a homemade muffin, L&L Beanery (706-632-3242) downtown is a local institution. Blue Jeans Pizza and Pasta (706-632-4936) has casual Italian with hefty portions, which could be just what you’re craving after a full day on the trails. Stay: The Morganton Point Recreation Area has camping on Lake Blue Ridge 15 minutes from town. The Aska Lodge B&B is only two miles outside of downtown and features a bottomless cookie jar. Events: Blue Ridge Mountain Adventure Race attracts the best teams from the Southeast. The ever-evolving course typically includes 46 miles of running, mountain biking, and kayaking through the Chattahoochee National Forest. Culture: Bill Oyster makes top-notch bamboo fly rods in his downtown shop and teaches classes where you build your own bamboo rod. Mingle: Head to Blue Ridge Brewery, just off Main Street, for an outstanding beer selection. Join the weekly local group rides of Aska or the Whitewater Center on the Ocoee. The former timber town has a picturesque main street sitting on the edge of the Monongahela National Forest just half an hour from Snowshoe Mountain Resort, and yet it’s still a sleepy burg with cheap real estate and vacant store fronts. “Marlinton is still off the radar,” says Kristy Lanier, a pro biker who opened Dirt Bean, a coffee house and bike shop in downtown seven years ago. Since then, Lanier has turned the shop into a renaissance hub, offering spin classes, yoga classes, sandwiches, coaching, and lodging just to make ends meet. But what Marlinton lacks in economics, it makes up for in potential. The town is minutes from some of the best singletrack in the state, has a 77-mile long greenway running through its city limits, and is a half-hour from some of the best downhill skiing in the East. “Marlinton doesn’t have all the amenities yet, but it has the potential to be a great mountain destination,” says Todd Kahler, a fresh transplant to Marlinton and proud owner of the town’s first legit watering hole. That potential is just now beginning to be realized. Thanks to Kahler’s new pub, you can finally get a decent beer in town; Dirt Bean is now offering shuttles for the Greenbrier River Rail Trail; and the younger minds are joining forces to create mountain bike retreat weekends that could help put Marlinton on the map. Play: Most bikers hop on the flat and beautiful Greenbrier River Trail. Get dropped off in Cass and pedal 25 miles back into Marlinton. For technical singletrack, head to the Gauley Mountain Network off the Scenic Highway. Tea Creek Mountain and Bear Pen are classic Monongahela singletrack with hairy descents. For more cross country style biking with bigger climbs and smoother, faster descents, check out the Laurel Run Trail, 12 miles outside of town toward Virginia. In the winter, head up Route 219 to Snowshoe for primo downhill. If there’s enough fresh powder, ski right out of town on the Greenbrier River Trail. Stay: For hostel-style lodging, take up residence at the Dirt Bean’s adjacent hotel. For higher-end digs with an in-house masseuse, check out the Locust Hill B&B. If you’re looking to camp gratis, Stillwell Park has riverside camping and showers just a mile outside of town along the rail trail. Eat: For healthy sandwiches and wraps, Dirt Bean is your go-to café. Also stock up on their homemade Super Cookies. They’re like energy bars, except tasty. If you’re in the mood for classic meat and three, the Greenbrier Grille is the ticket. Events: The Greenbrier River Race kick starts the cycling season the last weekend of April. Teams and solo competitors begin in Marlinton and run, canoe, and bike the length of the Greenbrier to White Sulphur Springs. Culture: Marlinton’s historic Pocahontas Opera House hosts regionally produced dramas and jazz orchestras. Mingle: The new River Pub has a solid micro brew selection, good pub food, and the occasional open mic pickers night. “I’m a mountain biker, canoeist, skier. So I created a pub that people like me would like,” says owner Todd Kahler. If you know Luray, Virginia for anything, you probably know it for the show caverns located on the edge of the city limits. The underground labyrinth is impressive, even if you like your caves a little less “showy,” but we like the town of Luray for what it’s got going above the surface, not beneath. Luray is bordered by Shenandoah National Park on one side and the George Washington National Forest (G.W.) on the other. As if that’s not enough, the Shenandoah River runs through the middle of those two public swaths of land, just a few miles outside of town. Luray’s natural attributes lured Gary Drum to town several years ago to open Appalachian Outdoor Outfitters. In a town of less than 5,000 people, the city has 300 acres of parks. The most impressive is the Luray Hawksbill Greenway, a two-mile path that has connected the community and led to the creation of several pocket parks throughout town. Play: Shenandoah River Outfitters has been sending boaters down the South Fork Shenandoah for 41 years. A scenic, class II, 11-mile canoe trip starting at Bealer’s Ferry is a must. You can pick up the A.T. inside Shenandoah National Park at Thornton Gap eight miles east of town. Head south on the A.T. for less than a mile for a side trip to Mary’s Rock, with stellar views. For more rugged hiking or trail running, head west to Massanutten Mountain, an extensive trail system within the George Washington National Forest known for its rugged and remote character. Start at Camp Roosevelt off Route 675 and tackle a nine-mile loop of Stephens Trail and Massanutten Trail that includes 365-degree views from a lookout tower on Kennedy Peak. Mountain bikers should head north to Shenandoah River State Park, which has a 23-mile trail system, much of which is open to bikers. Stay: Outlanders River Camp has tent sites on the banks of the Shenandoah River. Luray has recently been dubbed Cabin Capital of Virginia. Eat: Gathering Grounds has excellent coffee, pastries, and quiche for breakfast. The West Main Market is the go-to spot for hand-crafted deli sandwiches. For comfort food in a swanky setting, you can’t beat the Speakeasy at the Mimslyn Inn. Events: In 2010, the bike shop produced the inaugural Luray Crit and Luray Caverns Cross, and in May, the Massanutten Mountain Trails 100 Mile Run draws ultra runners from all over the region. Culture: Local artists have painted a dozen murals on buildings along the Hawksbill Greenway, most of which pay tribute to Luray’s agricultural roots. See that culture thrive at the Luray Farmers Market at the train depot on Saturdays. Mingle: Group road rides start at 7:30 on Saturday mornings at Ruffner Plaza downtown. The former mining town of 2,000, tucked deep into the Western North Carolina mountains, is most famous for its minerals—as well as its outdoor opportunities. Anglers flock to Spruce Pine’s nearby rivers, while big-time outdoor destinations like the Appalachian Trail, Blue Ridge Parkway, and Linville Gorge are less than 20 minutes away. The fact that Spruce Pine (which is only four blocks) has a downtown initiative should tell you a lot about the progressive attitudes in this mountain town. While some cities are desperately trying to lure manufacturing back, Spruce Pine has chosen to put their eggs in the natural resource basket, creating a pedestrian and bicycle plan to connect their neighborhoods, and looking at the surrounding watershed for trail development. The downtown is also home to several culinary hotspots, and a new brewery has recently opened. Play: You’ll find the high elevation balds of the Roan Highlands 30 minutes north of Spruce Pine off Route 261. Strike out on the A.T. from Carver’s Gap for miles of spectacular 360-degree views. Rhodo blooms in the late spring/early summer, and heavy snows during winter turn the Roans into a cross country ski mecca. Head south on Route 226 to the Blue Ridge Parkway for road biking. For crowd-free adventure, explore the privately-owned trail system on Springmaid Mountain. The 400 acres of loop trails are open to the public and less than ten minutes from town. Consider fishing a stretch of the North Toe, which runs through town, for browns, rainbows, and brook trout. Stay: Carolina Hemlocks has tent sites along the North Toe at the base of Mountain Mitchell just 20 minutes away. The Richmond Inn offers classic B&B digs near the heart of downtown. Eat: Kick start your adventure with coffee from Blue Ridge Java. Knife and Fork is a farm to table restaurant that sources everything from extremely local growers. Culture: The mountains surrounding Spruce Pine have a reputation for producing artists of all kinds. Check out the work of local artists at the Toe River Arts Council Center Gallery on Oak Avenue. Events: The Roan Moan metric century starts in nearby Bakersville and climbs 7,100 feet, including the beastly push up to Carver’s Gap. The Springmaid Splash is a popular trail 10K with steep climbs and river crossings. Mingle: The new Dry County Brewing Company offers hand-crafted beers and hand-crafted pies. Try the Scotch Ale. Quizzo night on Thursdays gets packed. You probably wouldn’t expect a small town in coal country to be a thriving arts community. And yet Whitesburg is widely recognized as one of the greatest arts communities in the Appalachians. Not bad, especially since just a few years ago, the town was in dire straits. According to Mullins, the town started coming back to life in 2007 when local alcohol laws were revised to allow restaurants to serve liquor. “That opened up the town considerably, allowing the opportunity to create social venues,” Mullins says. Today, Whitesburg has a legitimate bar, studio space, and performance venues that attract big- name acts and an impressive variety of artists and musicians. 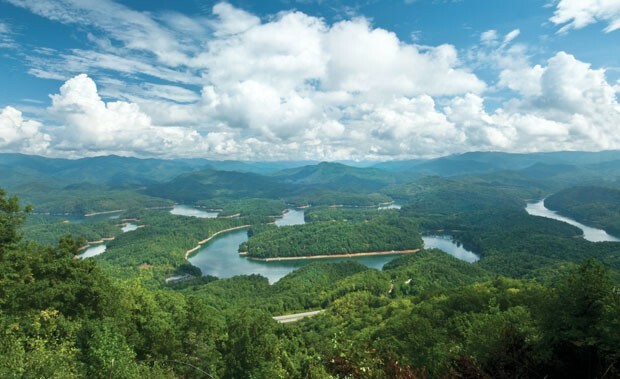 And all that energy sits at the base of Pine Mountain, a 125-mile long collection of ridges, cliffs, and hiking trails. Play: Bad Branch Gorge has dramatic hikes less than 10 miles from town. Take the mile-long Preserve Trail through the gorge to Bad Branch Falls, a 60-foot waterfall tumbling over a sandstone cliff. Kingdom Come State Park, 25 miles south on Route 119, sits on top of Pine Mountain. Go there to mountain bike the Little Shepherd Trail, a 38-mile long primitive road that follows the crest of Pine Mountain past countless overlooks and “hogbacks,” bizarre spine-like rock formations. The Pine Mountain Trail will eventually be a 110-mile-long wilderness route that connects Break Interstate Park with Cumberland Gap National Historic Park. Currently, 44 miles are open for hiking less than 20 minutes from downtown Whitesburg. Hike a piece of the 16-mile Highlands section for bogs and cliff-line views, or knock out a chunk of the 28-mile Birch Knob section, which rolls along the crest into Breaks Interstate Park. Stay: The Salyer House Bed and Breakfast has nice digs at reasonable prices. For camping, check out Carr Creek State Park, with campsites on a lake 12 miles west of town. Wiley’s Last Resort offers shuttles to Pine Mountain trailheads and camping near the trail. Eat: The Courthouse Café is the go-to spot in town for lunch or dinner, with homemade soups, classic southern fare, and vegetarian options, most of which are made from local ingredients. Events: Appalshop’s Seed Time of the Cumberland is a two-day festival of live music, movie screenings, and performances. Culture: Tune your radio to WMMT 88.7, Appalshop’s community radio station where volunteers spin the music they like. Head to the Underground Galleries at 229 to see regional artists on display. Try to time your visit with one of Whitesburg’s Art Walks, where several local businesses display local and internationally acclaimed art. Mingle: Summit City Lounge is an art gallery, bourbon bar, and performance venue that pulls in national acts of all ilk. There’s no obvious reason for Lewisburg to be as cool as it is. It’s not as if there’s a large university pumping forward thinkers into the community, or a ski resort attracting hipsters, and yet, it’s undeniable: Lewisburg is cool. While West Virginia has a statewide problem with retaining youth, Lewisburg has a vibrant, young population. While many other towns bend over backwards for the mining industry, Lewisburg has passed a resolution to halt fracking. And the arts scene is hopping, with galleries, live music, and regular arts-based events that bring thousands to this small town on the edge of the Monongahela National Forest. Just outside of town sits Monongahela’s newest wilderness area, sweet mountain biking, and fly fishing on the Greenbrier River. Play: Big Draft Wilderness is 10 miles from downtown. Hike the Blue Bend Trail, a five-mile loop that passes through old growth before climbing to a ridge for views. The Greenbrier River Trail’s southern terminus is a few miles outside of town in White Sulphur Springs, offering flat, riverside biking and running year round. If you’re in town during spring, consider a mellow paddle down the Greenbrier. For mountain biking, head east to 5,000-acre Greenbrier State Forest, which offers more user-friendly terrain than the Monongahela. Check out Rocky Ridge, a two-mile mostly downhill bomb off the top of Kate’s Mountain. Stay: Greenbrier State Forest has camping and cabins. Take your pick of B&B’s in and around Lewisburg. And the famous Greenbrier Resort is just outside of town if you’re wanting fancy digs. Eat: For coffee and breakfast burritos, head to the Wild Bean. Try The Market for salads with fresh greens and no-nonsense sandwiches and head to the General Lewis Inn for local trout served in a fine-dining atmosphere. Culture: Plan your visit for the first Friday of each month, when downtown shops and galleries open their doors with wine tastings, live music, and expanded gallery shows. Events: All downtown shops and restaurants join forces to offer a Chocolate Tasting Extravaganza for the Lewisburg Chocolate Festival in April. Mingle: The Irish Pub is the go-to joint for beer, shepherd’s pie, and live music. The Greenbrier Valley Bicycle Club has a regular group ride each Wednesday from the courthouse. In the last several years, more travelers and transplants have discovered what a few locals have known all along: Bryson City is an outdoor oasis. The small, historic downtown is bordered by the Great Smoky Mountains National Park, has play-boating within its city limits, and sits less than half an hour from class-III whitewater and world-class biking and trail running.Downtown, a new brewery has opened along with a new bike shop, yoga studio, and wine bar. Play: Because of its proximity to the Nantahala River, Bryson City has an unusually large percentage of top-notch boaters. Rub plastic with them at the Devil’s Dip, a play-spot on the Tuckasegee right in the heart of downtown. If you haven’t paddled the class II-III Nantahala, 20-minutes south, it’s a must. If flat-water kayaking is your bag, Fontana Lake has finger-lakes paddling along the undeveloped shores of the Great Smoky Mountains National Park. For hiking, head to the Deep Creek area of the Smokies, where less crowded trails await. The Indian Creek Trail will take you deep into the park’s backcountry. The Tsali Recreation Area is a nationally-known mountain bike destination. Pedal a piece of Tsali’s rolling singletrack with views of Fontana Lake and see what all the hype is about for yourself. Stay: Deep Creek Campground sits on the edge of an ice-cold creek between Bryson City and the Great Smoky Mountains National Park. For luxury cabins on the mountains surrounding town, check out Watershed Cabins. Eat: The new Cork and Bean has become the place to eat. The coffee shop/wine bar has organic, fair trade coffee and specialty crepes. Anthony’s Pizza, a Bryson City institution for decades, has arguably the best New York-style pizza in Western North Carolina. Events: Tsali plays host to a variety of bike and multi-sport races throughout the year. Culture: The nonprofit Great Smoky Mountains Association is building a cultural center in Bryson City that will host historical and cultural programs. Stop in to find out more about the communities that once thrived in the area before the park and lake were established. Mingle: Belly up to the bar in the Nantahala Brewing Company’s new tasting room for craft beer goodness. NOC guides and pro boaters who call Bryson City home have adopted the brewery as their own. Bluegrass aficionados have been flocking to Galax for decades. The town’s list of Appalachian music credentials, which includes the world’s most renowned fiddler’s convention, has led Galax to be dubbed the “old-time music capital of the world.” In recent years, the town has also been gaining the reputation as an adventure hub. Galax is a town that has retained its Mayberry charm with a small, but vibrant main street And it’s within striking distance of some of the best road biking and hiking in Virginia. The New River Trail starts in town; the A.T. is less than an hour away; the Blue Ridge Parkway is only seven miles from town; and Grayson Highlands State Park is just a 45-minute drive west. And surrounding Galax are hundreds of miles of low-traffic country roads for road biking. Play: Pick up the Parkway just outside of town and ride in either direction until your legs fail, but the surrounding country roads are just as scenic. Ride through neighboring Fries and you’ll pass farms, churches with bell towers, and one-room school houses. The 57-mile New River Trail begins in Galax and heads north. Tackle a piece as short as the 2.2-mile stretch to Cliffview, or hire a shuttle and knock out a longer chunk of this former rail line. For hiking, head into Grayson Highlands State Park for big views, rocky outcroppings, and wild ponies. Stay: The Fiddler’s Roost B&B has private rooms and cabins. If you’re looking to rough it, Cliffview has primitive camping off the New River Trail a couple of miles from downtown Galax. Eat:Check out String Bean Coffee Shop on Main Street for your caffeine fix. The state barbecue championships are held in Galax every year, and the Galax Smokehouse sets the standard. Events: In August, the Old Time Fiddler’s Convention draws thousands to see a massive display of Appalachian music at its finest. Culture: Every Friday night, live bluegrass is broadcast from Galax’s world-famous Rex Theater. The 475-seat theater has been revitalized in recent years, and when nationally acclaimed bluegrass pickers aren’t playing, you can find vintage movie nights and community plays. Mingle: Saturday nights, the String Bean Coffee shop turns into a small, acoustic venue for regional bluegrass bands. The owners even run a small studio and label attached to the café. Roughly translated, Ohiopyle is Native American for “white frothing water.” It’s an appropriate description, given the town’s proximity to the 18-foot Ohiopyle Falls that stretches across the Youghiogheny River in downtown. Tucked into Pennsylvania’s Laurel Highlands, the tiny town of 75 sits inside the 20,000-acre Ohiopyle State Park, with trails stretching in all directions from downtown. The mighty Yough runs a loop around town, offering amazing kayaking and commercial rafting during the spring, summer, and fall. And in the winter, Sugarloaf Knob, one of the tallest peaks in Pennsylvania, offers cross country and backcountry skiing. Play: Cruise the Great Allegheny Passage, a 135-mile rail trail that runs through town, or head for the McCune Trail for sweet singletrack that rips up and down Sugarloaf Knob inside Ohiopyle State Park. Hikers should check out Jonathan Run, a little-used creek-side trail accessing multiple waterfalls. Kayakers need to paddle “the Loop,” where the Yough forms a horseshoe around the city. There’s 400 yards of land between the legs of the river, so you can paddle 1.5-miles of class III whitewater (including the falls), take out, and walk 400 yards back to the put in. In the winter, Ohiopyle gets 100 inches of Lake Effect snow, and sits half an hour from Seven Springs Resort and Wisp Resort. Stay: If you’re looking for high-end digs, consider the five-star Namoclin Woodlands Resort outside of town. Ohiopyle State Park has camping and cottages. Eat: Rapid Java (on the porch of Wilderness Voyageurs) has your a.m. organic coffee. Check out the Firefly Grill for tasty wraps and healthy fare. Ohiopyle House Café offers white table-cloth dining adjacent to the Great Allegheny Passage Trail. Culture: The country’s most famous architect, Frank Lloyd Wright, designed two homes nearby. Check out Falling Water to see an example of how he blended architecture with nature. Events: In August, boaters race the Yough for the Over the Falls Festival. Mingle: Hundreds of people hang out on the rocks next to the Yough doing nothing more than sunbathing. At night, the same crew heads to the Falls City Pub for the selection of microbrews and pub grub. Only a few universities can boast rock climbing and hiking on their campuses. Even fewer still have such extensive trail and cliff options that they warrant full-fledged hiking and climbing guidebooks. Such is the case for The University of the South, a 150-year-old college that sits on top of the Cumberland Plateau and has given birth to the small town of Sewanee, Tennessee. The town actually sits on school grounds, its buildings owned by the university and leased to private business owners. As a result, town growth has been kept in check while the 13,000 acres of surrounding forest the university owns have been protected for recreation. Adventure begins on the edge of town. The campus, dubbed the Domain, offers 50 miles of hiking trails and 15 miles of sandstone cliffs to explore and the patchwork of state parks that make up the South Cumberland State Recreation Area begin 15 minutes outside of town. Play: Backpack the entire 20-mile Perimeter Loop for the ultimate Domain experience. You’ll pass bluffs, creeks, views, lakes, and do it all without too much elevation gain. 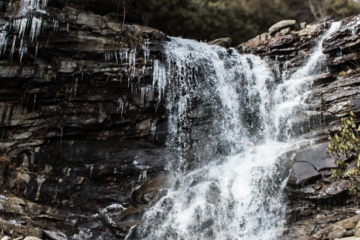 For a shorter hike, check out Bridal Veil Falls, a two-mile round trip that drops 400 feet off the Cumberland Plateau to a 50-foot waterfall that cascades over a sandstone cliff before disappearing into a sink hole. For mountain biking, pedal the 7.5-mile loop on the St. Andrews Campus for hilly, but sinuous singletrack. Venture beyond campus and backpack the 17-mile Fiery Gizzard Trail, which begins in Grundy State Forest and cruises through a creek gorge with waterfalls and massive boulders. And some of the best sport climbing in the South can be found about 30 minutes outside of town at Foster Falls, a state park with two miles of steep, technical cliff line. Eat: Fuel up in the morning at the Blue Chair, which also has a killer pimento cheese sandwich for lunch. For dinner, Crust Pizza is the ticket with its cracker-thin crust. Stay: The Red Oak Hollow is a guest suite and cottage on 30 acres near campus, and neighboring town Monteagle has hotel options. Culture: The university brings an array of guest speakers to town throughout the year, and old-time music jams and farmer’s markets sprout up at the school’s Community Center. Mingle: Shenanigans has inventive burgers and sandwiches and good craft beer along with live music wrapped up in a relaxed college town atmosphere. Join the Tuesday morning group mountain bike ride or the Thursday morning road ride from Woody’s Bicycles. Don’t go to Frostburg looking for adventure camaraderie. You’re not going to find cars loaded with kayaks and mountain bikes in downtown Frostburg yet. This small town in the western corner of Maryland could still be considered quaint, with a small university (Frostburg State) and historic main street that are still very much off the radar of most adventure-loving travelers. Fine by us. While most adventure tourists are flocking to more crowded options, Frostburg sits quietly on the edge of the Great Allegheny Passage, a rail-trail that offers 135 miles of hiking and biking between Cumberland, Md., and Pittsburgh, Pa. The Great Allegheny Passage is just a few miles from Big Savage State Forest, one of the largest state forests in the U.S. Big Savage offers 50 miles of trails, including 10 miles of cross country ski trails, as well as 12,000 acres of designated wildlands with pristine trout streams and primitive backcountry hiking. Play: Connect the 10 miles of bike-friendly single and double track within New Germany State Park, a 400-acre piece of the massive Savage River State Forest, for a tame, but scenic cross country ride. Highlights include the steep downhill on Red Trail and the tight, twisty switchbacks on Dog Leg. Cast a fly in the Savage River, a narrow stream that drops 85 feet per mile on its way to the Potomac, boasting healthy populations of wild trout along the way. The Great Allegheny Passage runs through town, connecting to the C&O Canal Towpath in neighboring Cumberland. The two rail trails combined offer 320 miles of traffic-free pedaling between Pittsburgh and Washington D.C. Pedal the 15 miles to Cumberland, then catch the Western Maryland Scenic Railroad back to Frostburg. In the winter, head to Savage River Lodge and the Mt. Aetna Tract for miles of groomed cross country skiing. Eat: Grab coffee and an organic bagel at Mountain City Coffeehouse on Main Street. For fried chicken and fresh seafood, head to the Hen House, a Frostburg institution. Stay: The Trail Inn B&B has reasonable rooms and a campground. If you’re looking for upscale lodge digs with a trail system right out the front door, look no farther than Savage River Lodge inside the Savage River State Forest. Culture: Main Street Books (301-689-5605) is an impressive independent book store that hosts regular author readings. The Palace Theatre is a restored movie house with live performances and independent movie nights. Mingle: Sand Springs Saloon. Steak nachos, chicken wings, and a full bar in a college town. Need we say more? Okay, how about Shut Up and Drink Night, which features $10 unlimited drafts. The A.T. runs through the heart of Trail Town U.S.A., as does the Virginia Creeper Rail Trail and Iron Mountain Trail. Nearby Mount Rogers boasts 400 miles of trail. Picturesque main street is surrounded by Pisgah National Forest and Dupont State Forest, both chock full of waterfalls, breathtaking vistas, and epic trails. During winter, Davis is the most authentic ski town in the South, with cross country, backcountry, and lift-served downhill terrain. During summer, mountain biking takes over while the surrounding wilderness areas are havens for backpacking. 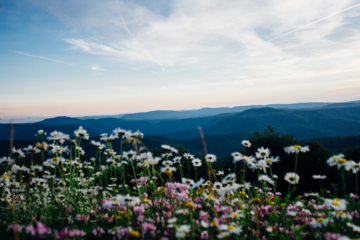 The High Country town is packed with upscale shops and restaurants, and it’s bordered by Pisgah National Forest and the Blue Ridge Parkway. Epic road rides begin in town, the popular carriage trails of Moses Cone are just outside the city limits, and three ski slopes are nearby. This mountain town sits an hour north of Atlanta, offering access to cherished bike trails like Bear Creek and Mountaintown, and class II-III whitewater on the Cartecay. This quaint mountain town (population: 635) sports an outfitter, an ice cream shop, several restaurants, a selection of accommodations, and world-class recreation with the Appalachian Trail and the French Broad River running through town. It also has one of the South’s few natural hot springs. The East’s tallest mountains provide the backdrop to Black Mountain, which has easy access to Mount Mitchell and the Blue Ridge Parkway. Classic mountain bike rides like Kitsuma and Heartbreak Ridge begin outside of town. McHenry, a.k.a. Deep Creek Lake, sits in the heart of Maryland’s most vibrant mountainscape. It’s surrounded by state forests; the Adventure Sports Center now includes whitewater rafting; and Wisp Resort offers over 100 acres of downhill and cross country skiing.